Tickets: £8 (£7 concessions and Gallery Supporters) Book online, or visit the Gallery in person. Lydia Corbett (nee Sylvette David) was one of very few people to model for Picasso at his request. She talks to curator Elizabeth Cowling about her experiences with the artist in 1954. For a few months in 1954 a beautiful young girl entered the life of the century’s greatest artist. What followed turned into a magical episode, a wonderful stroke of good fortune that changed her life. Pablo Picasso was living at Vallauris in Southern France when he saw 19-year old Sylvette David with her boyfriend, Toby. Picasso in his almost paternal appreciation of her great beauty and grace, and without trying to take anything from her, gave her the beginnings of self-belief and a feeling of being special. 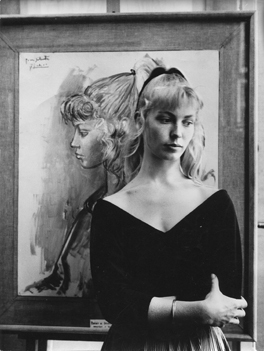 Sylvette became the subject of a series of over 60 portraits. Ranging from the entirely naturalistic to the thoroughly cubist, they were exhibited later that year drawing an excited response, as people marvelled at the virtuosity on display. But Sylvette did more than simply pose. Picasso now 73, fighting fiercely with mortality and separating from Françoise Gilot, mother of his children, found in her innocence and withdrawn simplicity a restorative, a refreshment and a distraction. In return Sylvette was nurtured and set in good soil to continue her life with confidence. There is so much more to her story, both before Vallauris and in the many decades that followed, as she gradually blossomed into Lydia Corbett, herself a much exhibited painter, sculptor and potter. Her book I Was Sylvette written by her daughter Isabel Coulton, describes her fascinating life’s journey.